Fate: Surrendered to the Americans on May 8th, 1945. The 12.SS-Panzer-Division Hitlerjugend ("Hitler Youth") was a German Waffen SS armoured division which saw action on both the Eastern and Western fronts during World War II. As with all parts of the Waffen-SS, it was found to be a criminal organization by the Nuremberg Trials. 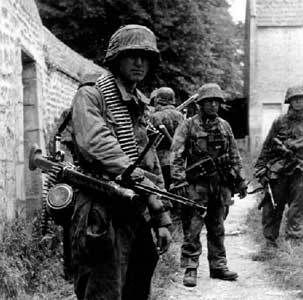 The 12th SS Panzer-Division in particular established a reputation for atrocities in the first days it saw combat in Normandy. 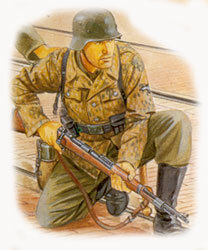 The Hitlerjugend was unique because the majority of its junior enlisted men were drawn from members of the Hitler Youth born in 1926, while the NCOs and officers were generally veterans of the Eastern Front. The idea of a Waffen-SS division composed of Hitlerjugend (HJ) members was first proposed by SS-Gruppenführer Gottlob Berger in January 1943. Berger approached Reichsführer Heinrich Himmler with the proposition, and Himmler soon became an enthusiastic advocate. The plan for a combat division made up of all HJ members born in 1926, was passed on to Adolf Hitler for his approval. Hitler was also enthusiastic about the idea, and on 10 February 1943, the official order for the creation of an HJ division was issued. Berger nominated himself as the divisional commander, but Himmler instead chose 1.SS-Panzergrenadier-Division Leibstandarte SS Adolf Hitler (LSSAH) veteran, SS-Oberführer Fritz Witt. A competition was held to design insignia for the new unit. The winning design, picked from thousands of entries, depicted the Hitlerjugend sigrune crossing a key from the 1.SS-Panzergrenadier-Division LSSAH's insignia. By 1 September 1943, over 16,000 HJ recruits had completed their six-week basic training and were listed on the rosters of the SS-Panzergrenadier-Division Hitlerjugend. As training continued in Beverloo, Belgium, the division was notified that it was to be formed as a panzer rather than a panzergrenadier unit, and the division was redesignated SS-Panzer-Division Hitlerjugend. Many of the recruits were so young that they were supplied with sweets and candies instead of the standard tobacco and alcohol ration. In late October 1943 the division received its final designation, 12.SS-Panzer-Division Hitlerjugend. While the HJ members, who had grown up under NSDAP propaganda, were fanatically committed to the Nazi cause, they lacked any military aptitude. To provide a skilled backbone for the division, veterans from the 1.SS-Panzer-Division LSSAH were assigned to the Hitlerjugend division as officers and NCOs. Training for the division was unusual. Witt, realising that the division had to be made ready for combat as quickly as possible, ignored many rules and regulations and instead focused on realistic combat scenarios and live-fire exercises. A result of this was that the morale of the HJ was exceptionally high, and the relationship between the officers, NCOs and men was an informal one, based on mutual trust and respect. In March 1944, the HJ was deemed ready for active service and was ordered to move to Caen in Normandy, where it was to form a part of Panzergruppe West, the German armoured reserve. Throughout the spring of 1944, the division continued training exercises in the peaceful area around Caen, familiarising itself with the terrain. This was to prove invaluable in the months to come. On 27 May, Witt celebrated his 36th birthday and his recent promotion to SS-Brigadeführer. The peaceful 'holiday atmosphere', as one grenadier described it, was soon to be shattered. At the beginning of June 1944, the division was declared ready for combat operations. The Division's tank strength at this time was 81 Panther ausf A / G and 104 Panzer IV ausf H / J tanks. The division was also equipped with Jagdpanzer IV/L70 tank destroyers, three prototype Wirbelwind flak vehicles, along with a number of 20mm, 37mm and 88mm flak guns, Hummel, Wespe and sIG 33 self-propelled guns and regular towed artillery pieces. However, its tank destroyer unit, SS-Panzerjäger-Abteilung 12, was not ready for action and was understrength in Jagdpanzer IV. On 6 June 1944, the Western Allies launched Operation Overlord, the invasion of Normandy. The HJ, along with the 21.Panzer-Division, was the closest armoured unit to the landing beaches. Due to Hitler's authorisation being required to release the panzer units, the HJ was not ordered to the front until 1430 on 6 June. The division's advance to the areas near Sword and Juno Beaches was severely hampered by incessant allied Jabo (fighter-bomber) attacks. Forward elements of the HJ finally reached their assembly area near Evrecy at 2200 on 6 June. On 7 June, SS-Standartenführer Kurt Meyer's ("Panzermeyer") SS-Panzergrenadier-Regiment 25, along with the II./Abteilung from SS-Obersturmbannfuhrer Max Wünsche's SS-Panzer-Regiment 12, were supported by artillery and ordered to crush advancing Canadian infantry and armour and drive through to the coast, still only a few miles away. In Meyer's words they were to "throw the little fish into the sea". Although they destroyed many Canadian tanks and overran a company of the North Nova Scotia Highlanders in Authie, the attack failed to break through the advancing Canadians. Meyer had relied on the shock value of the rapid attacks that had served his units so well on the Eastern front but here in Normandy, as both sides were to discover, effective scouting was a key element to an attack. The 25 Regiment had been forced to launch their attack into the flank of the Canadian advance a full hour before Meyer initially planned to strike. Without support from other units on his own flanks and no reconnaissance information with which to plan his attack it was initially very successful but rapidly lost its momentum. The North Novas in Authie bought time for the other companies of their regiment to establish defensive positions. The Sherbrooke Fusiliers lost over 25 Sherman tanks to the Panzer IV tanks and anti tank guns of 12th SS in the opening minutes of the counterattack. The 12 SS managed to push the portion of the Canadian spearhead they attacked back two miles but the remaining North Nova Scotia Highlanders, without artillery support or any armour halted the 25th regiment and established a firm defence. According to accounts from Canadian prisoners who survived the events, the youth of the Hitler Jugend were frustrated and mad with rage and there were numerous incidences of North Nova prisoners being shot, bludgeoned to death and even run over with a truck while they were being marched along a road. Battle casualties for the day on both sides were virtually even. Both forces suffered approximately 80 killed and around 175 wounded or captured. It was a hard and bloody fight to a draw. Meyer set up his command post in the Abbey Ardennes, whose towers provided an excellent view of the countryside. In the early evening of June 7th, as he planned the regiment's next moves, a further 18 Canadians were interrogated and then executed on the grounds of Abbey. In all over 100 Canadians from several regiments are documented as having been killed after surrendering to the 12SS. Meyer's regiment was deployed near the villages of Authie and Buron, in positions covering the vital Carpiquet Aerodrome. Forced to stay in place to contain the North Nova's brigade they were unavailable the next day to support the 26th Regiment in its attacks. They would remain on the same ground until driven off in vicious hand to hand fighting with the Highland Light Infantry of Canada on July 8th. On 8 June, SS-Panzergrenadier-Regiment 26 under command of SS-Obersturmbannfuhrer Wilhelm Mohnke arrived on the battlefield. Meyer's attack had pushed back one part of the Canadian advance but another brigade had occupied a group of small villages two miles into the German line. They crossed behind Meyer's regiment and the 26th took up positions to their west. After planning and positioning the regiment for a powerful thrust the I Battalion launched an attack towards Norrey-en-Bessin, defended by the Regina Rifles of 3rd Canadian Division. Their orders were to drive over the Canadians and force a deep wedge between them and the British division to the west. Again, no reconnaissance of the Canadian positions was done and this time the youth of the 12th SS infantry would wade into a maelstrom of defensive fire from firmly established defensive positions. The attack, launched at 0330 hours some 8 hours after Meyer's battle ended, had little initial success. The various companies in the attacking 12th SS failed to co-ordinate their moves towards the Canadians and despite heavy casualties during repeated attempts by the infantry, Canadian artillery and supporting heavy machine guns of the Cameron Highlanders of Ottawa took a heavy toll of each attacking company of SS troops. The Regina Rifles held their ground, and the I Battalion fell back. On the Canadian right, the II Battalion attacked the Royal Winnipeg Rifles defending the village of Putot-en-Bessin. The Battalion managed to break into the village and surround several companies, effectively pushing the Winnipeg's out of the village, inflicting 256 casualties - of which 175 were taken prisoner . However a counter-attack launched at 20:30 by the Canadian Scottish regained Putot-en-Bessin, and the II Battalion withdrew and dug-in south of the village. By nightfall on June 8th the Canadians were sitting in a firm position well within the critical area near Caen and the Carpiquet airfield, and further attacks against Norrey-en-Bessin and Bretteville L'Orguilleuse between June 8th and June 10th failed to dent the Canadian defence. Both sides had suffered serious losses, and again many Canadian prisoners were executed after their surrender. 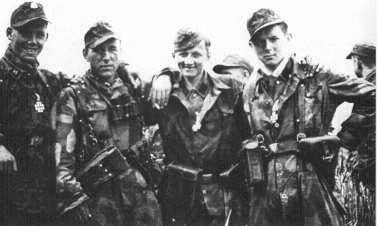 The SS-Aufklärungs-Abteilung 12(reconnaissance battalion) under SS-Sturmbannführer Gerhard Bremer participated in the attacks on June 8th and they were responsible for the after the battle killing of over a dozen Canadian troops. Bremer himself is reported to have been directly involved. The 2nd Battalion of the Monke's 26th Regiment murdered a further 20 some odd men, most from the Winnipeg Rifles in Putot. Before their capture the men who defended Putot had inflicted numerous casualties on the 2nd Battalion but the bodies of the murdered Canadians were found well away from the village. Following the battle SS-Aufklärungs-Abteilung 12 deployed to the west of Mohnke's regiment, and by the evening of 8 June the division, having failed in its assignment to drive the Canadians into the sea, had effectively halted the units of the 3rd Canadian Infantry Division in the Allied advance on Caen. These Canadian units were the only ones in the entire D-Day effort that managed to reach their assigned objectives. Despite the ferocity of the 12th SS counterattacks, the Division failed to fulfil its orders to throw the attacking allies back into the sea. Once British troops had moved up to the positions now firmly held by the troops of the 3rd Canadian Infantry Division that faced the 12th SS, the British dug in and established a firm line of defence from which they could launch future attacks. The allies were firmly on the continent to stay. The panzer army that contained the 12SS and the 21st Army Group they opposed, settled into a bitter series of battles that would finally lead to the liberation of Normandy. On 14 June, a British naval barrage hit the divisional command post in Venoix, killing Witt and leaving the division without a commander. The thirty-three-year-old "Panzermeyer" was ordered to take command of the division, becoming the youngest divisional commander of either side during the war. Over the next four weeks, the division managed to halt all Allied attempts to take Caen, despite the Allies' superior numbers and overwhelming air supremacy. The ferocity of the combat during this period equalled or exceeded anything the German troops had encountered on the Eastern front. (In this case also, Meyer was convicted of war crimes - he had ordered his men not to take prisoners.) No such order was given on the Allied side of the lines but it was scarcely needed. Time and again to the consternation and often sadness of the attacking Allied troops, the brave youth of the 12SS fought to the bitter end. Despite their successes in breaking up several major attacks, the division suffered immense losses, and in the first week of July 1944, Meyer ignored orders to hold the line north of Caen and withdrew the shattered remnants of his division south of the city. In the fighting from the day after D-Day until 9 July the division had lost 4,000 dead with a further 8,000 wounded and missing. The division was to have little respite though, and on 19 July took part in the defence against the Anglo-Canadian Operation Goodwood. Following this, the division was pulled out of the line and used to form the mobile reserve for I.SS-Panzerkorps. Rather than rest and refitting, the division found itself involved in constant fire-brigade actions. In early August, the division took part in defensive actions to halt two Allied operations, Totalize and Tractible. At the launch of Totalize, the sixty remaining panzers of the HJ were faced with over 600 tanks of the Canadian First Army. Despite these odds, the division managed to halt the offensive short of its objectives. Hitlerjugend, reduced to a few thousand men and a handful of vehicles, now took part in operations to try and keep the Falaise Pocket open and to help trapped German forces to escape. During this period the Panzer regiment's commander, Max Wunsche, was captured by British forces. On the 20th of August as the pocket collapsed and tens of thousands of troops of the Seventh Army went into captivity. The scattered remnants of the division were pulled back behind the Seine River. While they had established a reputation as fierce combatants, the actions of those men responsible for the murders of Canadian prisoners had forever sullied the escutcheon of the 12th SS. Hitlerjugend was given a brief respite, but received virtually no reinforcements or equipment. The division was soon thrown back into battle, and took part in the fighting withdrawal to the Franco-Belgian border. By September 1944, the division counted less than 2,000 men, without armour or heavy equipment. On 6 September, Kurt Meyer was captured by Belgian partisans. Meyer had removed his SS uniform and was wearing the uniform of a regular German army officer. In the confusion of the withdrawal, the division was unable to undertake a rescue attempt. SS-Obersturmbannführer Hubert Meyer was placed in command of the division. In November 1944, the division was pulled out of the line and sent to Neinburg in Germany, where it was to be reformed. The majority of the much-needed reinforcements were transferred Luftwaffe and Kriegsmarine personnel, and the reformed division would never match the elite status it had boasted in the spring of 1944. Late in the month, Hubert Meyer was replaced by SS-Obersturmbannführer Hugo Kraas, and the division was attached to SS-Oberstgruppenführer Sepp Dietrich's 6.SS-Panzer-Armee, which was forming up for Operation Wacht Am Rhein (the Second Battle of the Ardennes, popularly known as the Battle of the Bulge), a large-scale offensive to recapture Antwerp and halt the Allied advance. The operation opened on 16 December 1944. Kampfgruppe Peiper from the Leibstandarte SS Adolf Hitler led the assault, breaking through the enemy lines. The HJ, which was to follow the Kampfgruppe and exploit the breakthrough, became bogged down in traffic jams caused by the 12.Volksgrenadier-Division. When the division reached the front, it was met with heavy resistance from American troops stationed on the Elsenborn Ridge. Despite several intense efforts, the division could not budge the American defenders. As a result, the division was ordered to swing left and follow the advance line of the remainder of the Leibstandarte SS Adolf Hitler. American defenders prevented the division from reaching its objective, and after the destruction of Kampfgruppe Peiper, the advance of Dietrich's army altogether. Near the end of the year, the HJ was shifted south to take part in the efforts to capture Bastogne, and saw heavy fighting around the city. By 18 January 1945, the HJ, along with all the German forces, had been pushed back to its starting positions. On 20 January 1945, Dietrich's 6.SS-Panzer-Armee was ordered east to Hungary where it was to take part in an offensive to recapture the Hungarian oilfields and open the way to Budapest, where 45,000 men of the IX.SS-Gebirgskorps had been encircled. While the division was in transit, the IV.SS-Panzerkorps launched several ill-fated relief operations. The HJ, alongside the LSSAH as a part of I.SS-Panzerkorps arrived in Hungary in early February 1945, only a few days before the city fell. The division was thrown into action against the Gran Bridgehead, a strong salient formed by the Soviets over the Danube near the town of Gran. The HJ and the LSSAH both fought well, and by the end of February the bridghead had been destroyed. The division was next to take part in Operation Frühlingserwachen (Spring Awakening), the operation to retake the Hungarian oilfields. Hitler, desperate to keep the operation a secret, had ordered that no reconnaissance of the battlefield was allowed before the attack began. The attack got underway on 6 March 1945 in atrocious conditions. The spring thaw meant that the German attack was confined to a few narrow roads, and after initial successes, the offensive was aborted after a Soviet counterattack threatened to encircle the German forces. After the failure of "Frühlingserwachen", Hitler lost faith in the Waffen-SS and ordered that the honorary cuffbands issued to the divisions involved in the attack be returned. Outraged at the order, Dietrich refused to pass it on to his men. In mid-March, a heavy Soviet counterattack near Stuhlweissenberg split Armeegruppe Balck in half and resulted in a general withdrawal towards Vienna. The HJ was involved in many desperate rearguard actions, and on 13 April fell back from Vienna. Withdrawing through Odenburg and Hirtenburg, the division reached Linz, Austria near the American lines. On 8 May 1945, 10,000 survivors of the division surrendered to the Americans near Enns. In a final act of defiance, the division refused to drape their vehicles with white flags, as the Americans had ordered.